Uniform data storage and data naming within the projects of kinofreund eG. Easily understandable and comprehensible - even to outsiders. Working collaboratively on projects with a uniform naming. v0.1 mainly refers to video and audio data and their "immediate surroundings" (for example, subtitles, software project files, etc.). Each project will receive a six-digit project number (YYPPPP) to uniquely identify. Additionally an abbreviation of the project title should be used. This acronym is used only as a guide and does not need to follow an algorithm. Example: "130001_SkyCaptain" for the film "Sky Captain and the World of Tomorrow" with the kinofreund project number "130001" (first project 2013). Data exchange between departments for example, image editing, VFX, color correction, etc.) via "Export" folder. Example: The VFX Artist exports a VFX shot into his "VFX Export" folder. The editor will go to the "VFX Export" folder and builds the shot directly therefrom into the film without copying it previously into the "film editor" folder structure. This avoids double storage of data and version chaos, as the most recent version of a file is always in the "Export" folder of the departmens. Once enabled, data in the "Export" folder may not be deleted, renamed or moved. 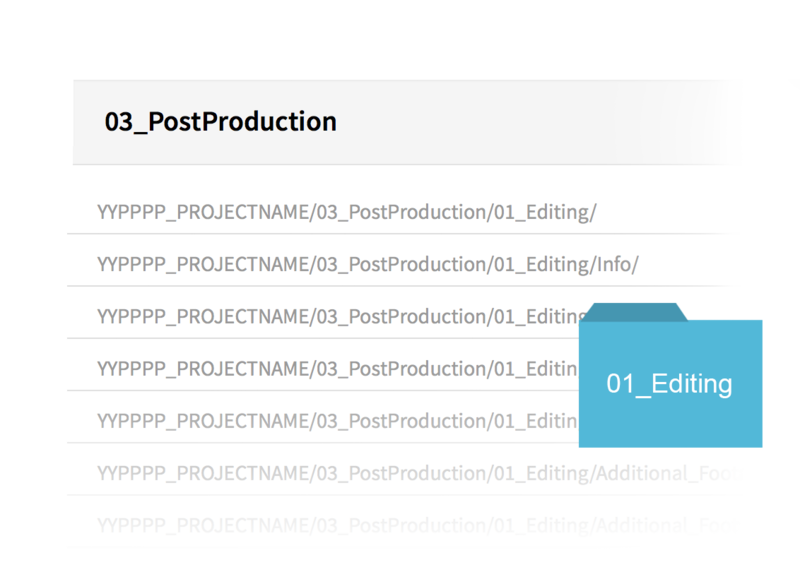 Within the folder structure of the post-production each department (Editing, Audio Post, Video Post, Mastering) operates only in its individual folders. The above-mentioned "Export" folder is used for the data exchange between the departments. Within these areas folders also get fixed numbers, so that the folder order displayed in the file browser keeps identical when sorted alphabetically. In addition to specific folders, for example for video raw material, there are often so-called "Info" folder for notes, reports, examples or other documents that do not need to be reused directly. The folder structure must be extended naturally to new folders. This should, however, follow the basic concept and possibly should be discussed with other kinofreund members. Here folders are created per film version (cinema, TV, languages, etc.). They include folders for each format (for example, DCP, BluRay, DVD, etc.) and receiver, in order to always know for whom, when, what version of the film was made. The for this purpose required film components (video tracks, audio tracks, subtitles, etc.) are located in the particular 03_PostProduction and/or 04_Mastering ("Export") folders and are assembled directly from it.